Louise McDonough of the International Labour and Research Branch of the Australian government, remained a strong proponent for a Convention on domestic work. Read the following excerpt from her closing remarks to see how governments advocated for the rights of domestic workers. Chair, this Committee was charged with developing an international standard that provides meaningful protections for domestic workers across the world – a standard which sets the appropriate international benchmark for generations to come. 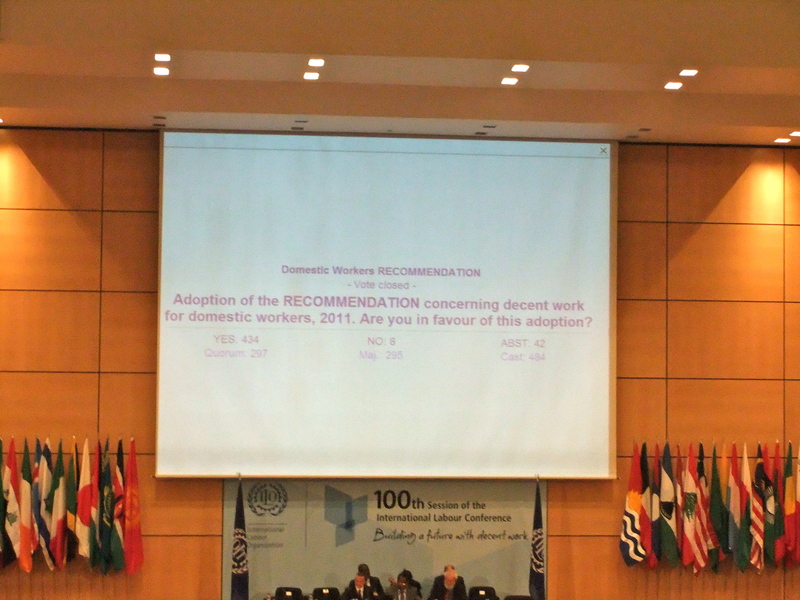 Australia is pleased with the outcome of the Committee’s work – a Convention that prescribes minimum protections for domestic workers and a Recommendation that provides guidance to member states on how to extend these protections to this vital segment of the global labour market, to finally lift them into the formal economy to take their place alongside all other workers. As Australia said in our opening statement – there is no doubt that the measure of our success is in terms of the impact the Convention will have in the real world. In this respect a number of countries, including developing countries, have already shown the way with effective domestic legislation for domestic workers already in place. 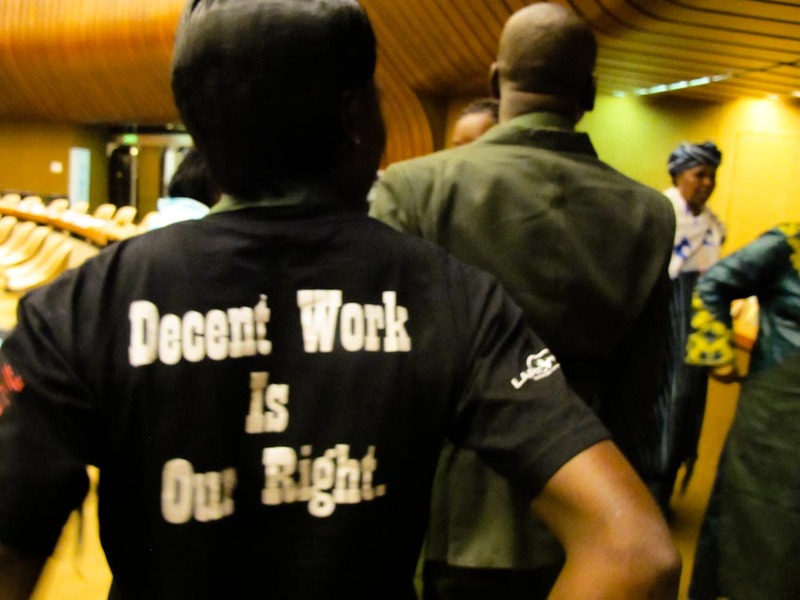 We encourage all governments to embrace the opportunity to provide decent work for domestic workers by ratifying the Convention and we look forward to its widespread ratification. We appreciate that ratification will often require amendment to national legislation and Australia is no exception in this regard. However, if national law and practice was already adequate, this house would not have been charged with developing international instruments for domestic workers across the world who largely work in the informal economy. As always, ratification of ILO conventions requires amendments to national law and practice and this situation is no different – so our approach should not be that we can’t ratify, but rather how can we ratify. Because if countries don’t amend their laws to meet the international standard, the situation for domestic workers around the world will not change. 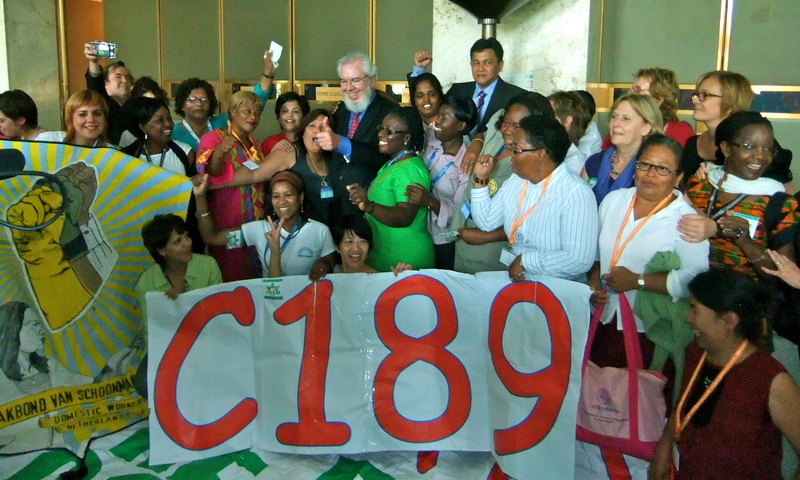 Finally, Australia has been very proud to have been part of the development of this historic Convention and Recommendation for Domestic Workers – we pay tribute to every one of the 100 million domestic workers across the world, including those who have attended these proceedings, we recognise domestic workers for the professional workers that they are, and we commend them for having the courage to stand up and seek this recognition as legitimate workers, often against all odds. Australia hopes this new international standard will make a strong and substantive difference to the quality of your working lives and mark a new era of decent work for domestic workers. To learn more about today’s victory, see our joint press statement here. For more information on the context of our work at the ILO, see the attached summary. Members of IDWN joined the Swiss national trade union and gender rights advocates in a public demonstration and march in honor of the struggle to attain labor rights and political representation for Swiss women. A tapestry with 3000 domestic workers’ handprints travelled from Hong Kong to Geneva for this event. 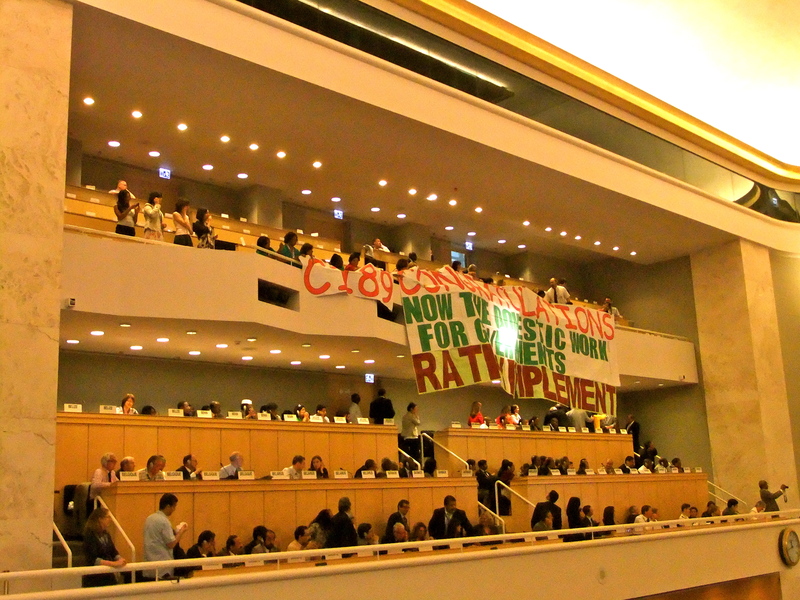 Pictured here are a series of IDWN’s global statements of solidarity in the struggle for labor and women’s rights in Switzerland. Journalist Isabel Garcia-Gill wrote an in-depth news article on three members of the IDWN. Her June 11 Le Temps article, “La longue marche vers la dignité” [The long march to dignity] received national coverage and a front page feature. Photographer Alan Humerose created the striking images of Ernestina Ochoa, Narbada Chhetri and Fataou Raimi from the main lobby of the International Labour Organization.